Stuck for an idea for your child’s party? or would you like something bespoke to suit your child’s wishes and needs? We can offer the perfect solution. See our leaflet below. 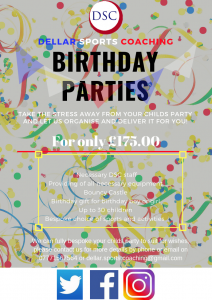 If you would like any more information regarding our birthday party packages please contact us via email or phone on dellar.sports.coaching@gmail.com / 07771567564. Alternatively check us out on Facebook / Twitter and Instagram.